I found the mini bar in my Norwegian hotel room irresistible. While in the United States, I have no urge to eat the three dollar Snickers bars and the six dollar Heineken's that the typical hotel chain stocks for the weary traveler. When I was in Norway however, the junk food was foreign and tempting. When I looked inside my mini fridge I saw a half dozen entirely unfamiliar candy bars. One night, I broke down and took two items out of the mini bar. The first thing I ate was a dark chocolate candy bar that contained marzipan and raspberry jelly. Kind of good, but also kind of gross. But then, oh but then! THEN I ate some Chili Nøtters. 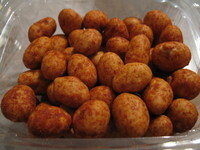 A chili nøtter is a peanut wrapped in a sort of cracker-like shell and then dusted with a salty chili flavor. YUM! I love me some chili nøtters. Every day I was in Norway I ate a handful of nøtters, and in the airport on the way home I picked up a small package to eat later. I was so enraptured with the chili nøtter, that once I was back in Buffalo I took some pictures with googly eyes. Googly eyes + food = true love. About a week after I returned from Norway I opened the package of chili nøtters I had purchased in the Norwegian airport. After licking the last granules of chili dust off my fingers, I figured I had seen the end of my beloved nøtters. Well, look at what I just found at Wegman's (my local grocery store). Chili Nøtters! 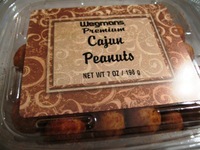 Only now they are called Cajun Peanuts! This has me thinking- What other delights have gone unnoticed in Buffalo until now? Are there some fjords around here that I have somehow never found? Do Western New Yorkers, unbeknownst to me, actually speak three languages? Is there a socialized health care system that I have managed to miss? If the chili nøtter is actually just a readily available snack food item, perhaps I shouldn't be so desperate to leave Buffalo. If I can just walk into Wegman's and buy nøtters, what else can I do around here that simply never occurred to me before? Maybe, I shouldn't be trying so hard to escape this seemingly mundane and nøtterless land. Maybe, I have everything I need right here. I just had another look around - and found chili nøtter! It is my son's favourite snacks. BTW - nøtter (nuts) is in Norwegian plural for nøtt (nut), so nøtters is a double plural ;) (We do have a strange language). Thanks Christian and Rune! I do have to say that Cajun Peanuts are no where NEAR as delicious as Norwegian chili nøtter. Thanks for teaching me about nøtt and nøtter. Heehee. Say hello to Norway for me! I am from Norway, and yes I too love "Chili nøtter". However this translates to; "Chili nuts", so I would rather use this. Never heard of cajun peanuts though. People viviting Norway usually come for the nature, not the snack. :P We have lots of different kids of Chili nuts, however the best one is probably "Polly Chili Nøtter", however this is the most expensive one. Nice story, love to read what foregners think of my country! I hope you come visit our country again soon! PS; As a side-not, the chocolate you ate is called "Troika", and I think it is very good. Hello out there "Chili nøtter" lover's! We to love this fabulous snack food, in fact we loved them so much we started making them here in the states! Check us out, We are sure you will love them! I've had the notter and the nutterz, I like them both.Hats off to bmorenutz.com I spend 3 months a year in Norway, Its good to have Chili Nutterz in the USA now. Norway is a beautiful country. I had these recently, they are from Frito Lay and are very close to the Norweigan/Swedish notter. I think that they have limited distribution because I haven't seen them at many stores. I bought them at a Super America in a suburb closeby.